So many of our obscure classic rock posts have come from the garage thus far I think I should make a separate category profiling garage-rock bands of the mid 60s. Before the psychedelic revolution there was a large focus on the garage-rock sound (around 1963-1967). The British Invasion – specifically “beat” groups like the Rolling Stones, The Animals, and the Kinks had a large influence on these bands, as did folk-rock groups that were beginning to experiment in America. This mishmash of influences helped form famous garage-rock bands like the Kingsmen, The Count Five, The Syndicate of Sound, and the Leaves (and even the Troggs in Britain). This genre of music provided much inspiration to the future punk music movement and it also laid a foundation for the soon-to-be psychedelic movement which sparked in popularity during the years of around 1966-1970. But – like with any popular genre – there were bands that fell through the cracks. 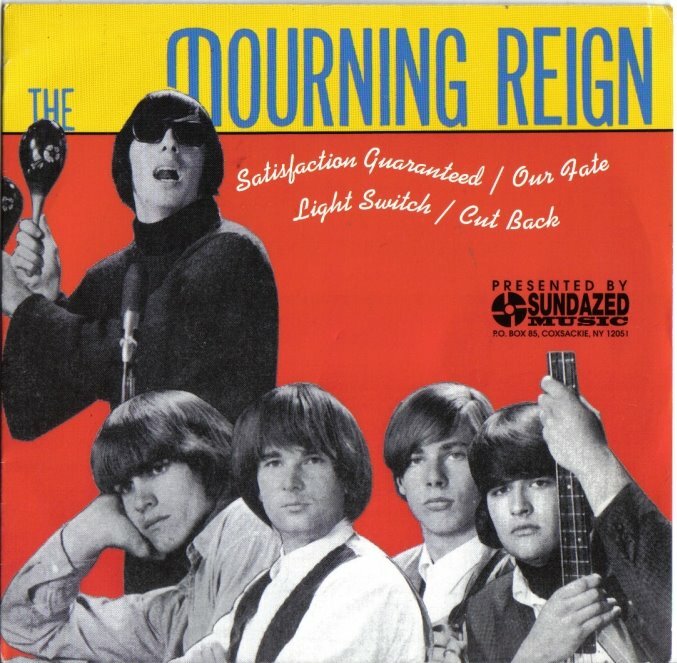 Today we are going to take a look at the Mourning Reign, a San Jose band that formed in 1965 and broke up in 1969. This band combined the fuzz of garage rock with folk rock. They even played around with hints of psychedelic music. Let’s listen to some tracks. The first few notes of “Satisfaction Guaranteed” scream garage rock. A fuzzy guitar and well-defined bass provide the rhythmic backing to the introduction. Everything about this song is typical garage sound – from the Jagger-like vocals (which I must say are very well done by Beau Maggi) to the choral harmony. When I first listened to this I thought that it sounded like some song – and then I quickly realized it sounds like 100-or-so songs I know and listen to. So where does it differ? The multiple-guitar solo is wonderful and atypical. This band had a surplus of guitarists and they used them to their advantage. That may be the best part of the song which otherwise is simply a solid, enjoyable garage track. “Light Switch,” which appears on the same EP, immediately takes a 180 degree turn. It makes you perk up. The band takes from its folk-rock influences, but, more from early 60’s pop melody. The vocal harmonies are fantastic. They are tight and, wait, what was that. Is that a church bell and a plucked acoustic and an accordion. The song transforms into this odd progressive (even psychedelic) segment halfway through and this leads up to rising percussion and a Phil Spector-like wall-of-sound vocal moment briefly. This is an oddly prescient segment. The song ends on a guitars ominous twang. Absolutely the best song by The Mourning Reign and one that should be listened to by all. Couldn’t pull up Satisfaction guaranteed, cause the imbed isn’t there. Second one is definitely garage rock. Oops! My bad. It’s up now. Thanks! Been there, done that haha. Absolutely. Such a recognizable sound. i love this band. i remember watching them at the continental ball room in Santa Clara. they had more singles they recorded, to be you can’t find all their music. what ever happened to all the music of the mourning reign. they were a great band. Beau … hey stranger it’s me Lana Jay’s wife (now ex 🤣) still think of you often and when you called & told me you were getting married. A beautiful wedding I’ll never forget. It has a good amount of their material and is definitely worth checking out. Thanks! I have great memories of them playing in Northern NJ with Mike Hossack on drums. Good point. Was very sade to hear about Hossack’s passing. He was an excellent drummer. Thanks for sharing JBB. Beau Maggi, holy cow! So cool to see you around. Leaving my email. Would love to catch up! Beau Maggi, I left a message but registration got the best of me! This is Donnette. I left an email address. We need to catch up. Wow. So great to hear from you. Fascinating. I’d love to talk more about your recollections of West Coast music in the 60s. Thanks for the comment! Hi Monique, I was one that ‘hung around’ with the band in a big old house they rented in San Jose. Have you been able to locate or communicate with any of the Mourning Reign members?